Under previous versions of 1Password and browser extensions and 1Password mini I was able to unlock/open one of these and they would all open. This morning I opened 1Password 7 but it didn't unlock the 1Password X browser extension in Chrome. Is that by design? Can they work in sync when running on the same computer? Sync Type: 1Password.com and Dropbox I think? Hi, @chazzunokuthunuchtec. Right now, 1Password X doesn't have any connection to 1Password for Mac, so it needs to be unlocked separately. We are exploring ways to let 1Password X benefit from the presence of the Mac app without sacrificing the unique experience of a standalone browser extension. It's something we are definitely interested in and would definitely include some shared unlocking like the other extension has. (Actually, to be technical, the other extension is never locked or unlocked because it doesn't have any of your data. All it does is pass messages back and forth with the native app. This is the main thing that makes the 1Password X scenario different because it needs to safely perform a true unlock of your data.) Right now now, both the Mac team is riding the wave of a massive launch and the Windows team is preparing to do the same. Since this will require some coordination with both of them, it's a little ways out, which is about the most specific timeframe I can give you. I hope this makes sense for the time being. Please do keep an eye on the release notes and our blog because this will be something worth shouting about when it is available. If I use and unlock 1Password X in Chrome but forget to unlock 1Password mini in OS X (a situation when 1Password X is unlocked but 1Password main app is still locked by accident) then the ⌘\ shortcut doesn't fill in a password but instead prompts me to unlock 1Password mini. That's an easy fix. I can unlock the 1Password mini. But then I could reasonably presume that the shortcut won't be using 1Password X. Is there another shortcut for 1Password X? Or, as @brenty mentioned should I instead of 1Password X just use the alternative Chrome extension for 1Password? I prefer Safari in general, but there are some few sites (ob.macu.com and their bill pay service or statement center, and the uvu.edu Canvas area, and sometimes Netflix) that work better in Chrome and so for those exceptions I use Chrome rather than Safari. @chazzunokuthunuchtec: In Chrome, the shortcut to open 1Password X is ⌘/Ctrl Shift X. In Firefox it's ⌘/Ctrl . (period) So you can select the login you want to fill there. But the inline 1Password X icon in username and password fields is really handy too. Cheers! I love 1Password I use it many many many times a day and I have been a loyal customer for over one year. I also love how fast you respond here in the support forums, thank you for this! When you announced 1password X ("X" for short, so "CHEX" refers to the old Chrome Extension, "X" refers to the "1Password X" chrome extension) and 1Password 7 ("1P7" for short) beta I quickly switched over. I love both X and 1P7, you have made a lot of GUI improvements. However, as OP, I find it EXTREMELY frustrating that unlocking 1P7 does not unlock X and vice versa. I have been frustrated with this since their release and been hoping and hoping and hoping that you might fix this / let them talk to each other (exactly like 1P6 and CHEX did!). But no such fix has come. Do you plan to fix this, for me it is a regression bug since it worked beautifully with IP6 and CHEX? 1) Lowering my security by shortening my master password - something that I really do not want to do and something you security experts probably oppose too. It is difficult to decide which of my three alternatives are the least terrible. Now I sounded extremely upset, sorry about that. I still love you, your work and my life is dependent on you! :D But I do hope you understand my frustration? 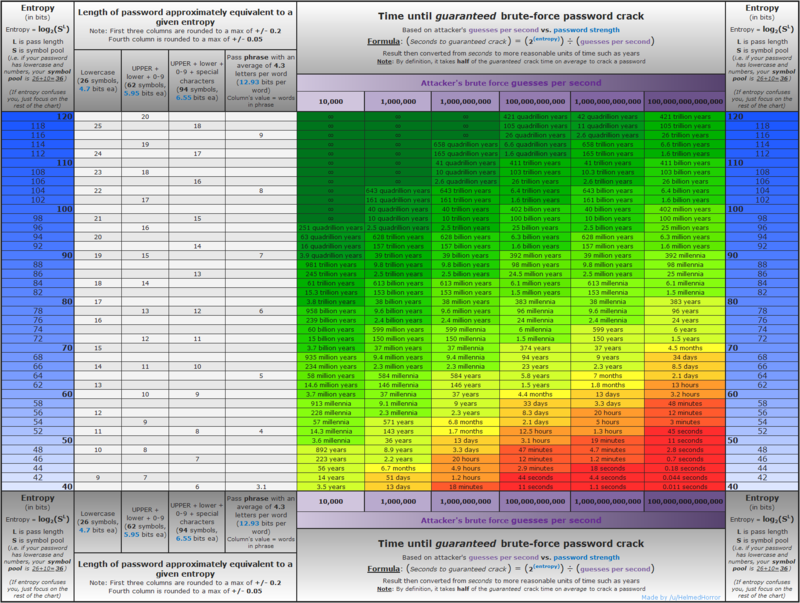 Miscellaneous 1: Why did you lower the security in the password generator in X to a maximum of 50 chars instead of 64? M2: Does IP7 work with CHEX? @Sajjon: lol I was really confused at first when I kept seeing "CHEX", so thank you for explaining. Beloved AgileBits! I love 1Password I use it many many many times a day and I have been a loyal customer for over one year. I also love how fast you respond here in the support forums, thank you for this! Likewise, thanks for your kind words and support, and taking the time to contact us here. It means a lot. I am a macOS and Chrome user. Earlier I used 1Password 6 ("1P6" for short) with the Chrome extension ("CHEX" for short) When you announced 1password X ("X" for short, so "CHEX" refers to the old Chrome Extension, "X" refers to the "1Password X" chrome extension) and 1Password 7 ("1P7" for short) beta I quickly switched over. I love both X and 1P7, you have made a lot of GUI improvements. I'm glad to hear that you're liking some of the new stuff we've been trying in 1Password X! It's been fun experimenting with some new ways of doing things, and you've probably noticed that some of this stuff is slowly making its way into our other apps too. However, as OP, I find it EXTREMELY frustrating that unlocking 1P7 does not unlock X and vice versa. I have been frustrated with this since their release and been hoping and hoping and hoping that you might fix this / let them talk to each other (exactly like 1P6 and CHEX did!). But no such fix has come. Do you plan to fix this, for me it is a regression bug since it worked beautifully with IP6 and CHEX? I'm sorry for the frustration. This isn't something we can "fix" strictly speaking, as the reason 1Password X exists is so people have a way to use 1Password only in their browser, in cases where they cannot use one of our native apps. For example, folks using Chromebook, Linux, or unable to install apps due to company restrictions. So it's very intentional that 1Password X is "self contained" in this way. And, frankly, there's no Chrome (or Firefox) extension APIs that let us access stuff outside of the browser's sandbox. However, in the future, in case where the 1Password native app is available, we would like 1Password X to be able to interface with that. I can't say if or when that might be possible, but it's on our wishlist too, even if our priority has to be giving folks without the apps a first class 1Password experience in their browser. So that's what I'd recommend at this time, given your desire to have them work together. We love you too, and believe me: every time we unlock 1Password X on a Mac or PC we experience the same frustration. Hopefully we'll be able to make all of our lives easier in that regard in the future, but for now, as they say, "there's an app for that": the desktop extension can help. Where you're still talking billions of years to brute force it even at billions of guesses per second. So, provided you're using a random password that's roughly that length or longer, you can not worry about it at all and instead just make sure that the site will accept it. Yep! I went into more detail above, but please let me know if you have any other questions. have a great day! @brenty, as usual, you (AgileBits crew) wrote an excellent answer, I REALLY DO appreciate that, thanks a lot! I reverted back to CHEX and it works beautifully with IP7 and "synced unlocked" so now I am happy again and I will be looking forward to hearing news about X being able to unlock 1P7 (1P8?) and vice versa in the future. Thanks! Nice that you linked to the image I myself use for educational purposes when I teach security, that is indeed a good chart. Actually using upper, lower case and numbers and special chars would be 6.55 bits of entropy each right? So a length of 50 is 506.55 = 327.5 literally of the chart and 646.55 = 419.2, I can see that even 50 is overkill. @Sajjon: You're very welcome! And that's very kind of you. Thank you! If I can live up to the high bar set by the other great folks here at AgileBits, I'm happy. Sure thing! Glad that the desktop extension is a good fit for you. That's funny! That chart comes up here on the forum a lot actually. And indeed, when we add digits and special characters that makes it even stronger. I just wanted to use the 1Password X default as a baseline for comparison since that's compatible with most websites. But no harm in even more entropy where you can get it. Cheers! Am I over simplifying this to say use 1Password X if you are in an environment that doesn't allow for the 1Password desktop app, and, otherwise, use 1Password extension (desktop required) for Chrome? It's kind of up to the user really. Some prefer the things 1Password X does and are willing to accept that it doesn't unlock alongside 1Password for Mac/Windows yet (it's something we're looking at). For those that prefer the consistency the companion extension is still available and does mean it's a single unlock. I suppose it's the case of it's nice to have options and hopefully at some point it won't be an extra decision that needs made. Thanks littlebobbytables. So what does 1Password X do that 1Password extension (desktop required) doesn't do? How about a feature list for 1Password extension (desktop required), so I can compare. Thanks. And if you have any specific questions, I'm sure I can answer them.